Can a Felon Become a Lineman? Felons may think nobody will hire them after serving their sentence, but there are resources available. Many times it takes learning a new trade or starting a different career. Employers have discovered that felons make good employees, which can make it easier than they might think to get a new job. For those with experience in electrical work, becoming a lineman is an option. This blog post will address the issue of whether or not a felon can become a lineman. What is Required to Become a Lineman? How Much Does a Lineman Earn? A lineman is responsible for installing, repairing, and maintaining high power lines and above- or below-ground electrical cables. A lineman must have a good understanding of electrical and power equipment. They must also possess knowledge of electrical currents, voltage, and resistance. He or she will need to have strong analytical and problem-solving skills in assessing power cables for repair or replacement. There are a number of types of linemen positions, but the majority either install or repair electrical or telecommunications lines. Most employers require candidates for a lineman job to at least have a high school diploma or a GED. Lineman programs can be found at some technical colleges. On-the-job training and apprentice programs are also common. A two-year degree in electronics or electrical contracting can be beneficial for those looking for this type of work. An apprentice will work under a senior lineman. The apprenticeship can last as long as three years. There are no licensing or certification requirements to become a lineman. Employers will typically require that a job candidate have a CDL license to operate utility trucks. The candidate might also have to provide a physician’s certificate demonstrating that he or she is physically fit to perform the physical tasks required of a lineman. An official state apprentice program typically consists of approximately 7000 hours of on-the-job training. This often takes three and half to four years to complete and leads to a journeyman lineman status. According to the U.S. Bureau of Labor Statistics, there are approximately 227,000 working electrical linemen. The median wage for a lineman was $64,190 in 2017. The median wage is that income at which half of the linemen earn less and half earn more. Experience and skill level could have a significant impact on these earnings. It also depends on where an electrical lineman works. Areas of the country that are the highest paying for linemen are in the northeast and northwest parts of the country. Job growth for linemen and is expected to be 8% from 2014 to 2024. Continued development of new housing communities and businesses along with expanding suburban areas will lead to part of this increased growth. In addition, retirement of older linemen will also increase the growth rate. In order to be successful in their pursuit of becoming a lineman, it’s essential for felons to be honest about their background. They’re already working with the negative perceptions of being dishonest, untrustworthy, and unwilling or unable to follow directions from authority figures. There are re-entry programs, such as drug treatment, and educational opportunities for felons who need them. For many felons, having their felony expunged can give them the chance they need to begin with a clean record and succeed in becoming an electrical lineman. It’s a significant challenge, but it might be worth it for a felon that wants to become a lineman. Having his or her record expunged and also documenting any training programs or additional education could make the essential difference in a felon succeeding. What do you think about this blog post? 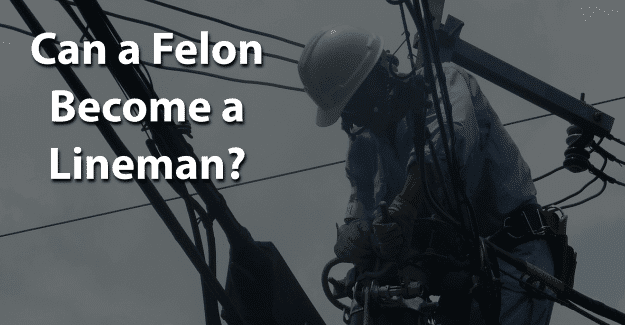 Have you or someone you know been in the situation of trying to become a lineman with a felony? What was that like for him or her, and how did he or she achieve success? Please tell us in the comments below. I’m 31 trying to find a career as a lineman. However, I caught felony charges (non sexual, non child related) at the age 18. Did my sentence turned my life completely around. I’ve been stuck in job positions living pay check to pay check. I’m ready to live out my pontential, grow my life, and actually have a career. Every where I’ve looked for lineman school they will not accept felons. I’m just wanting a chance that’s all.